Here we go again with another IPCC Report problem. According to this article, scientist in Bangladesh say Banglabullshit to the IPCC Report that states that 17% of Bangladesh will be flooded by 2050 from a one meter (3 foot) rise in sea-level. You can see what their expectations are per the chart. DHAKA (AFP) – Scientists in Bangladesh posed a fresh challenge to the UN’s top climate change panel Thursday, saying its doomsday forecasts for the country in the body’s landmark 2007 report were overblown. They accuse the IPCC of using this report to stir things up about global warming. Notice the term “consensus” which is how they prefer to have their “science” “proven” vs. scientific reality. The warning helped create a widespread consensus that the low-lying country was on the “front line” of climate change, but a new study argues the IPCC ignored the role sediment plays in countering sea level rises. Sediment? Hmmm…so what do they have to say about that? But the IPCC’s prediction did not take into account the one billion tonnes of sediment carried by Himalayan rivers into Bangladesh every year, the study funded by the Asian Development Bank said. Previous “studies on the effects of climate change in Bangladesh, including those quoted by the IPCC, did not consider the role of sediment in the growth and adjustment process of the country?s coast and rivers,” he told AFP. Even if sea levels rise a maximum one metre in line with the IPCC’s 2007 predictions, the new study indicates most of Bangladesh’s coastline will remain intact, said Sarker. Yes, I’d say a billion tons might just have some kind of effect on things there. I lost count of how many mistakes are in IPCC4, suffice to say, it’s way too many and the more they find the more I have the impression this is not a scientific document, it’s more like a Science Fiction Novel designed to scare the hell out of everyone so we’ll all start paying carbon taxes to save the earth. “Based on the findings of the study, it appears that most of Bangladesh?s coastline, notably the Meghnaestuary, which is one of the largest in the world, would rise at the same pace as the sea level growth,” he said. 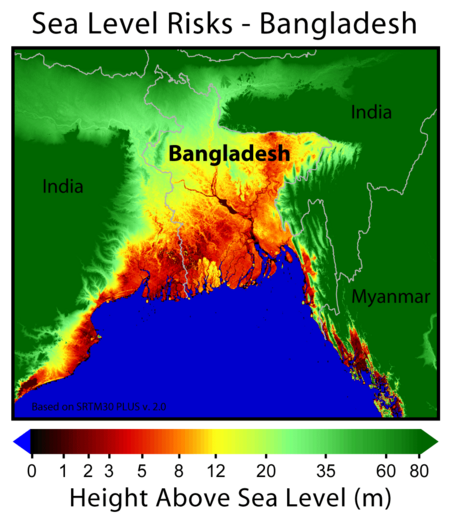 “The study shows that the inundation and flooding pattern of Bangladesh will change due to the sea level rise, but it will be less than what has been predicted,” by the IPCC and others, he said. Pachauri is still throwing his “one single error” out there hoping it will stick to the wall. If there were only one error the IPCC, Pachauri and all their buddies wouldn’t be having all the problems they’re facing regarding all the “mistakes”, lies, misstatements, altered data, missing data, “tricks”, etc., that seem to increase almost on a daily basis. One guy even actually admits they didn’t take this into account, kudos to him. Do these guys ever take into consideration what the effects of their fantasies are? I mean who would want to build anything in Bangladesh? Why would any big business want to spend capital building factories in Bangladesh if they believe IPCC 4 and figure it will be a waste of time and money because it will be underwater before they get a return on their investment? Why would the country want to invest in much-needed infrastructure if it’s going submarine in 40 years? This also nicely explains the “disappearing” island the warmers were touting as proof of global warming awhile back. The reason it disappeared wasn’t due to rising sea-levels from global warming as the “alarmists” would like you to believe. It was an island made of sediment, that appeared from a buildup of sediment and disappeared due to sediment washing away. A normal cycle of things in delta areas. 1 billion tons of sediment tends to do things like this. For all anyone knows the island could build up again over a period of time and reappear. What will the “warmers” say about that? Probably they’ll try to figure some way to blame that on global warming, too. If you want to read about the sea-level rise BS, there is a nice article on Watts Up With That? you can read here. Comments Off on Bangladesh BS!